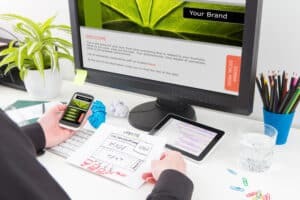 If you’re like most small business owners, a website redesign may sound like an unnecessary expense. After all, your current website probably took a lot of thought, time and money to complete. But technology and online behavior are constantly evolving, and a complete or partial redesign is often the only way to keep up. In the digital age, your audience’s first impression of your business is often based almost exclusively on the quality of your website. If you have a professional-looking, easy to navigate website, you’ll have won half the battle. That first impression alone will convince consumers that you’re the right brand to do business with. On the other hand, websites with structural and navigation issues can be an instant turn- off for potential customers. This can cost you leads, sales, and even cost you in terms of brand loyalty. One option out of such a situation is to consider a website redesign. While it’s not easy to get e-commerce sites with lots of images and perhaps even videos to load within a second, you should be aiming at two-second load times for your pages at worst. This is because 80% of internet users will move to your competitor if your site takes more than two seconds to load. According to Smart Insights, mobile currently accounts for 51% of internet searches in the USA, with PC contributing just 42%. Tablets (which are also categorized as mobile) account for the rest of the searches. This means that if your site is not responsive to mobile devices, you could miss out on a lot of traffic. If you’re not closing as many sales as you would have liked, poor website design may be the reason. Poor design may cost you in terms of ranking, leading to poor traffic numbers, and can also cause visitors to abandon your site prematurely. Visitors who land on your site, and quickly leave without viewing other pages on the site cause what is known as a high “bounce rate.” Sites with high bounce rates are seen by search engines as not providing a good user experience. These sites tend to rank lower in search engine results than sites with low bounce rates. Speaking of ranking, the only way to get a favorable ranking on Google is by engaging in a vigorous SEO campaign. And it’s not just keywords. You need a strong content campaign, a link building campaign, and high levels of structuring to be ranked well. These issues are often best addressed through a redesign. Finally, site maintenance is critical to a successful online presence. You need to constantly add fresh content to delight your customers and make your site easier to find on search engines. If adding such content on your current site takes hours, the site would greatly benefit from a redesign. Do you have other thoughts on this topic? Please post a comment to share them with us.